Having grown up in New Orleans, Chef Chris Dupont wanted to include a few classics from his childhood when he opened his contemporary Southern restaurant in Springville, Ala., in 1994. These days, you can still find the beautiful, fluffy and perfectly structured square beignets being served at Café Dupont, which has since relocated to Birmingham. 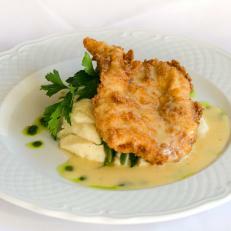 Another standout is the fried chicken served with a lemon butter sauce over a mound of creamy mashed potatoes.